The city of Gainesville has denied Dove World Outreach Center’s application for a burn permit to set fire to copies of the Quran on Sept. 11, but the church plans to burn the holy books anyway. So let me get this straight: A "church" called Dove World Outreach Center, 50 members strong, followers by their own admission of the Christian bible, reaches out to another faith by threatening to burn their sacred book. Is that the way it looks to you, too? 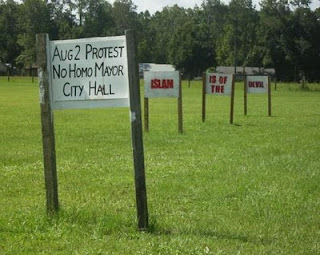 But their website is where it's at: In a blog titled "No Homo Mayor Protest", Fran Ingram seems to want to make the rant about those "homosexual sinners", but inexplicably cites a quote from Exodus first: Exodus 20:14 (New International Version)14 "You shall not commit adultery"
The seeming head blogger, Fran Ingram, wrote another blog called "Ten Reasons to Burn a Koran". It explains all. In the light of the above verse, a person has to be insane to belief that Islam prescribes execution for apostasy. In no uncertain terms, Allah commands Prophet to allow people to believe and disbelieve. If the Shariah recommends to kill an apostate, this law cannot be Islamic because it contradicts the above two verses." Okay. ..so now let's have a look at Deuteronomy 7:1: “When the Lord your God brings you into the land that you are entering to take possession of it, and clears away many nations before you, the Hittites, the Girgashites, the Amorites, the Canaanites, the Perizzites, the Hivites, and the Jebusites, seven nations more numerous and mightier than yourselves, 2 and when the Lord your God gives them over to you, and you defeat them, then you must devote them to complete destruction. You shall make no covenant with them and show no mercy to them. 3 You shall not intermarry with them, giving your daughters to their sons or taking their daughters for your sons, 4 for they would turn away your sons from following me, to serve other gods. Then the anger of the Lord would be kindled against you, and he would destroy you quickly. 5 But thus shall you deal with them: you shall break down their altars and dash in pieces their pillars and chop down their Asherim and burn their carved images with fire." So out of those 10 reasons there are NO reasons for burning the Quran. But that won't stop them, any more than a plea for common sense will stop them from attacking "homos". They are on a mission to avenge their version of God, and common sense is a big, fat loser. But wait. . .happily, there's more: Apparently their God is no match for the city, the bank and the insurance company. The only time any of the phony "churches" believe in separation of church and state is when they can get around having to pay taxes. A "church" only has to prove 51% usage in order to get full tax exemption. Pretty good, huh? That means they can claim outside profits of up to 49% of their income and still not have to pay taxes. The unfortunate truth is that God's hate pays way more than God's love. Wonder if there's a bible quote for that. You got that right. All of these Wingnut fanatics want this country and government to be a "God fearing, Christian" government. Except, of course, when it comes time to pay taxes and support this "Christian faith-based government" with taxes. Then it is extremely clear that there is a separation of Church and State that leaves churches exempt. At least there is only 50 of them and not more. But my fear is that these freaks are growing in number because of the fear mongering that's going on. Our society has lost its ability to think and reason for itself. So people are quick to believe what they hear in sound bites, and not ever question whether or not it is true. What a shame that these people don't realize how sick and depraved they really are. All reason and intelligence are lost on them. Hi Stan. You're right-- they are freaks, and our society seems to have lost its ability to think and reason. I want to believe the freaks are in the minority and it's only the press who is making them seem larger than life. I believe we need to call them on every one of their lies every time they spout them. That's were bloggers can come in--spreading the word, linking our blogs, letting the rest of the country know that they are minor little worms in the scheme of things, no matter how much attention they try to get. The press is always going to go after stories like this. I was pretty shocked to read that it was actually a "church" with only 50 members. Why give them that kind of press? It only encourages them. On the other hand, I'm glad I heard about them. I'm thrilled to be able to knock them down a peg or two. The leaders are hypocrites, their flock is ignorant. That makes them dangerous unless we send the posse after them. If I see coverage of these people burning the Koran at their church I will quietly burn a King James in my fire pit in my back yard. "and no religion too." Imagine that! Well, all things considered, they may be crazy, bu the ydo have a right to burn their own property, I must assume they did not steal the books in question? hm, dude, they might be protestants, hence to them all idolatry is sin, including the crucifix. The only way I'll be happy with them going through with their plan is if they accidentally spill some of the accelerant on themselves first. the earliest writings of christ come from almost 500 years after his supposed crucification. There is no concrete historical evidence that Jesus Christ ever existed at all, but there is ample anecdotal evidence that he existed and was crucified. Thanks Ramona. I agree with you. We need to continually pass this information on so that people are aware. There is a lot of press being given to such small groups (Look at the Teabaggers and their conventions. Small numbers, large press). I think Conservative folk are trying to make issues where there aren't any by sensationalizing everything they can. That doesn't bother me because they have always done this kind of thing. What does bother me is that they are now not even being careful about blatant racism and other prejudices. It's the not being hidden about it that frightens me. That, and the fact that "average" or "normal" Americans don't seem to think there is a problem with Conservative-speak anymore. We are losing our civility. That's really scary and dangerous. "But I say unto you, Love your enemies, bless then that curse you, do good to them that hate you, and pray for them which despitefully use you, and persecute you; That ye may be the children of your Father which is in heaven..." (Matthew 5:44-45). These Dove people are so hypocritical it shocks me how they have more than a single lunatic member. Islam is arabic for 'Peace', Love For All, Hatred For None.